Today we’d like to introduce you to Jody Merrill. Jody, can you briefly walk us through your story – how you started and how you got to where you are today. If you’ve ever met me, you know that I am a tall drink of water and was this height at the age of 12. Needless to say, I did not excel at sports. However, this did not stop me from participating and trying just about everything out there. Sports/fitness was more social for me, and I suppose it still is. I played soccer through high school, and then in college I completely fell off the fitness wagon. When I landed my first job, I started to find that I needed an outlet, and it was my mother that started dragging me to group classes. Shortly after I turned 23 my mother passed away from cancer, which really rocked my world. This loss is what ended up being a major driving force for me, and has pushed me to where I am today. After my mother’s passing, I found myself at a meeting for the Leukemia & Lymphoma Society’s (LLS) Team in Training (TNT). After this meeting, I signed up for a full marathon. I’d never run more than 3 miles, and I hated every second of it. But, that truly was a life changer for me. I was able to raise money for LLS and honor my mother, while pounding the pavement. I’ve competed in four marathons, which led me to triathlons. In total, I’ve completed eight endurance events with TNT and raised more than $100,000.00. Although these have been amazing events to be a part of, I was always injured while training. Doctors told me I needed to work on my core. A friend invited me to a Pilates class that was super core focused. I went and it was one of the most challenging classes I have ever taken. But, I instantly felt the impact of working my core on the studio’s reformer machines and was hooked. That year was the last time I threw my back out, and the strength I gained from these classes is what led me back to the east coast to open my first btone studio. Like anything, there are times when things are running smoothly and naturally fall into place. And for the most part people would never know when things weren’t running smoothly, except for my husband and Dad, of course! Recently, I’ve experienced how challenging and bumpy the road can be. It’s now been a full year trying to get our newest studio to open in South Boston. For the most part, I just roll with the punches, since much of it is out of my control. There are certainly times where I have to decline an opportunity, and hold off on big purchases and decisions. Nothing should be forced, and when it is forced, it usually shows. If you surround yourself with confident, inspiring, and smart people, then it helps to keep things running smoothly. You truly have to be a little bit nuts, slightly delusional, and have a huge self-drive to become an entrepreneur. The most difficult part of this process has been managing the stress that comes along with running a business. The more success your business has, the more headaches that come along with it. Stress causes you to breakdown in every way possible, and as a business owner staying level headed and healthy is a necessity. Having your own business can be one of the most freeing things you can do, but it certainly does not start out that way. If you believe in your product, put in the time, and surround yourself with truly good people you can make anything happen. Please tell us about btone Fitness. People love gadgets. All of our classes are equipment based, and we like to use equipment that you don’t see every day. Our specialized TONE classes are done on beefed up reformers, which are made with every BODY in mind. Whether a client is an athlete, newbie or working with injuries, we offer so many options for your resistance and body placement and pride ourselves on having each class work on the same routine to focus on all skill levels. In addition to our TONE classes, we offer ROW classes at many locations. This low impact workout is done on WaterRowers, for a full body, cardio experience. Most row classes are not done just on the rower. We incorporate the use of props to keep the interest up, the heart rate up, and the sweat flying! We even offer many hybrid classes that use both the reformer and the rowers. All of our classes focus on targeting muscle groups and working them to the point where they start to talk back to you. They will sometimes talk back so much that you will still feel them days later! With a growing team, and more and more people experiencing our equipment- based workouts, we’re excited to start a whole new way of delivering and planning these workouts for our clients. All of our classes are always different, but up until now, people never really knew what they would be getting when they walked into class. While no-one has complained about this, we knew we could do better. We have a team designing a program where our clients will get even better results. Week to week you will know if you are getting a workout geared more towards Lower/Upper body or Core. We’ve spent time designing these rotations so that clients who come once a week to 4-5 times a week will have a well-rounded routine that will leave them even more TONEd and confident. With our new rotation program, although still focusing on a total body workout, we are zeroing in on particular muscle groups, making sure our clients get the absolute most out of their time with us, since we all know that time is a very precious commodity. I would argue that Boston is one of the fittest cities around. We are surrounded by so many universities and colleges and so many hard working people. Bostonians are smart, and pressed for time so our 45 minute intense, results based workouts are perfect for the people of Boston. Being a hometown girl certainly helps. I understand the city and have been able to give our clients what they need. 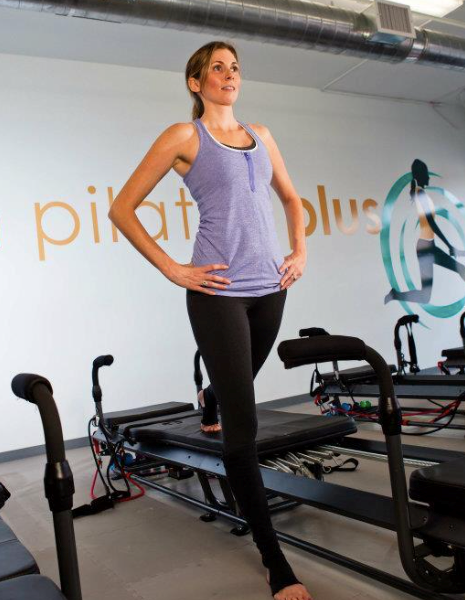 When I opened in Boston, fitness boutiques were just starting to come on to the scene. If you look around now you’ll see that this is a great place to be as there are a number of studios in every neighborhood in the city now.